Westlife is coming back to meet Malaysian fans after nearly two decades since their debut East Meets Westlife tour in Malaysia! Those who grew up lip-syncing and dancing to their hit songs such as ‘Uptown Girl’, ‘Flying Without Wings’, ‘Swear It Again’, and ‘If I Let You Go’ will get the chance to relive those precious memories during Westlife The Twenty Tour 2019 'LIVE' in Malaysia, taking place on the 8 & 9 August at Malawati Indoor Stadium. For more information visit MacpiePro's and Universal Music Malaysia’s social media platforms. Westlife is the UK's top selling album group of the 21st century and currently consists of four members, Nicky Byrne, Kian Egan, Mark Feehily, and Shane Filan. Westlife rose to fame with their debut international self-titled studio album, ‘Westlife’ in 1999 and since then they have secured 92 awards in major music awards such as Brit Awards, Meteor Awards, World Music Awards, and MTV Europe Music Awards. 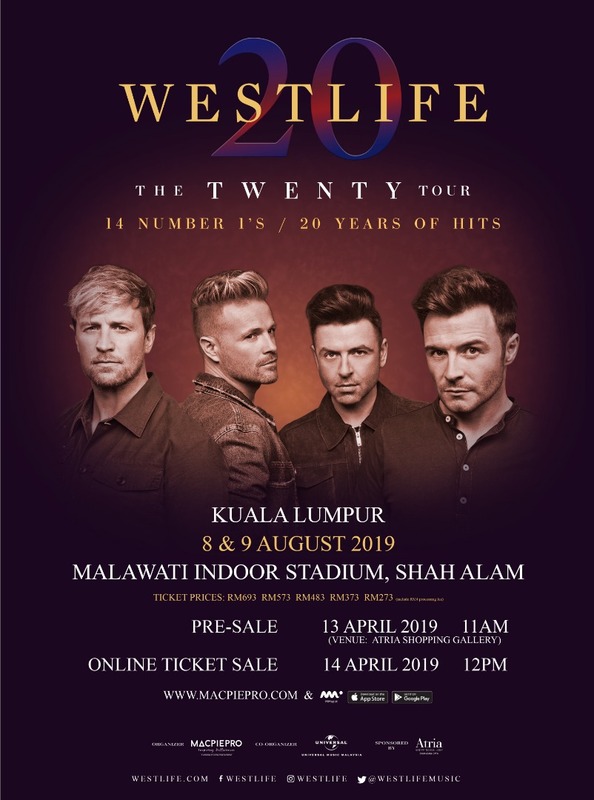 Westlife returns as a group for their 20 anniversary and announces their 'The Twenty Tour' concert along with a single release 'Hello My Love'. 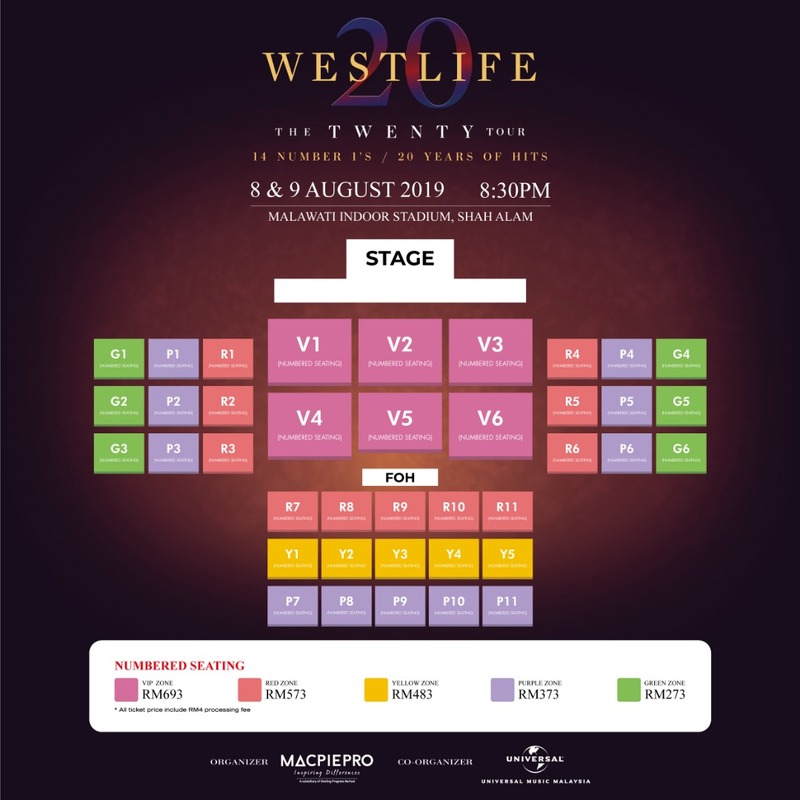 Westlife 'The Twenty Tour' has set an incredible record of selling 400,000 tickets in just 48 hours, which also marked Westlife's fastest selling tour of all time. Westlife is set to perform their greatest hits and all 14 of their UK No.1 hits including 'Swear It Again', 'Flying Without Wings', 'You Raise Me Up', and 'I Lay My Love On You' during the tour.